Underwater lighting for ponds, water features and fountains can add impact and interest to a garden at night. The combination of water and light adds an extra dimension to gardens at night. Viewed from indoors or the garden itself, the light can be focused onto pond features, or used to accentuate the rippling of moving water. With a variety of waterproof lights available, the move is towards long lasting low voltage LED under water lights, however halogen are also available. The idea of using lights in a pond or water feature is not new, however today it less expensive than ever, so from a swimming pool to a garden pond or fountain, you can now use underwater lights to illuminate them all from below the water as well as from above. Placed at the foot of waterfall, lights can help accentuate the flow of water at night, and from below reflections are minimised. 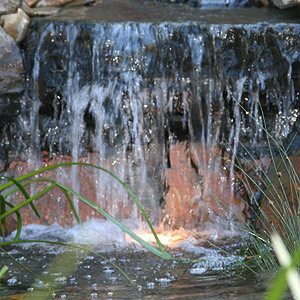 Choose from 12V systems or low voltage DC systems, the right choice can easily enhance any water feature, pool or garden pond. The advantage of a properly constructed LED underwater light is that the globe life is much longer than other globes. You will still need to clean and maintain the light, however, you will not need to change the globe very often. Although you can buy a DIY 12 volt LED for as little as $40 from most hardware stores, for more elaborate systems installation of underwater lighting should always be carried out by a licensed electrician. Submergible solar lights are beginning to find a place in the market, usually supplied with a battery back up for longer life. With a huge range of underwater lighting available including colored, focused and moving lights it is increasingly easy to illuminate a pool, pond or water feature. Always use purpose built underwater lighting.